← Guest post from Dad – to entertain you while I’m en route! 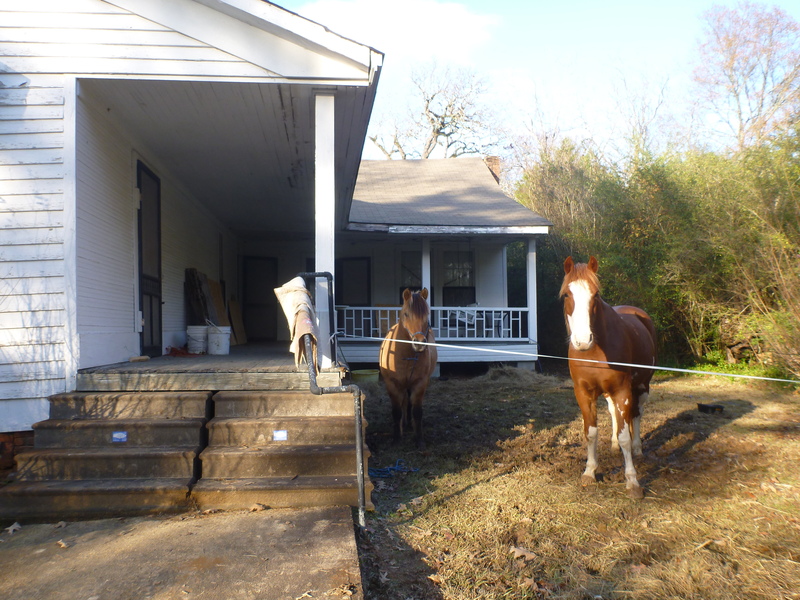 I woke up Sunday, the third morning in my own bed, in my own house, went out to say good morning to the ponies – and they were gone. Saturday night we’d ridden in Big Creek’s Redneck Christmas parade and I guess they’d decided that it felt good to be out on the road again stretching their legs. I headed out after them on gut instinct alone, no clue how long they’d been gone or which way they might have decided to go. I had a terrified young dog on a lead rope for moral support and very little knowledge of the lay of the land. At the end of the driveway I looked left and right, hoping that the ponies had left a trail of droppings to follow them by – no such luck – so I headed towards the town park where Jesse had found some tasty acorns while waiting for the parade to start. No ponies. I went down the alley behind the steak house, turning towards a bit of unfenced pasture I’d seen the day before and there they were, strolling down the road away from me, nonchalant as can be. When I whistled they looked over their shoulders and slowed down a bit and finally Finehorn stopped and let me put a halter on her. mr.James was still playing hard to get so Finehorn and I started for home and he managed to stay out of the road and keep us in sight while maintaining his independence until we reached the yard. 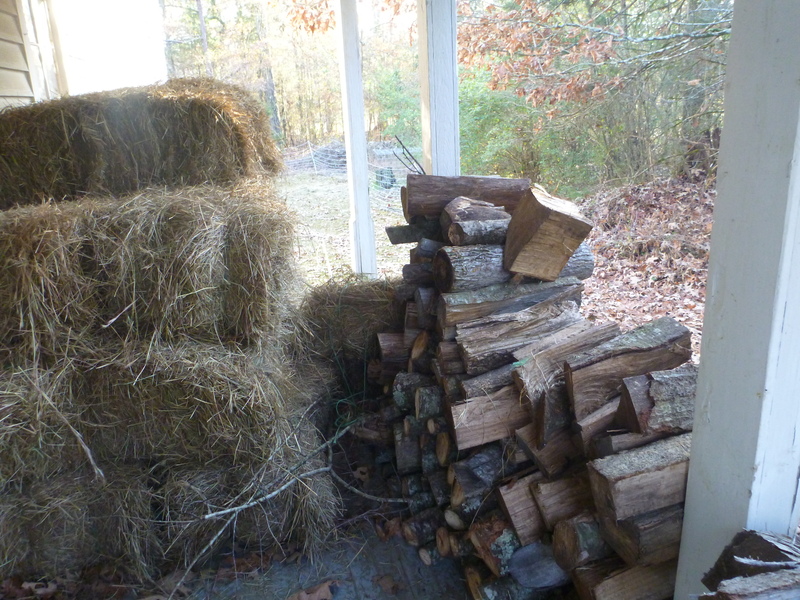 Tuesday morning I awoke to knocking and male voices calling “Hello!” Two men who introduced themselves as local farmers were offering corn for the horses and did I need any firewood? As the men were leaving one of them asked me if I ate duck. “I love duck!” The next thing I know I’m holding a brace of still-warm wood ducks by their necks and the men are driving away. 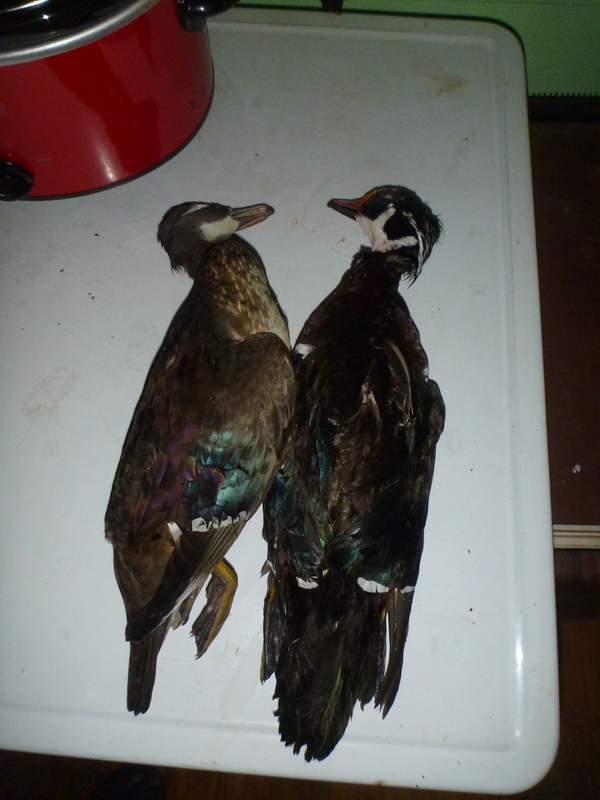 Heads, beautiful feathers, beautiful dead birds, guts and all – dinner, theoretically. OK. Deep Breath, I can handle this. So I did the sensible thing and walked over to the Big Creek Store, serving breakfast and lunch, presided over by Nell. I explained my dilemma and asked for help. We made a date and at 12:30 I walked over again, carrying the ducks by their necks, to find a large plastic bag and a cardboard box on the floor of the kitchen. Nell worked on one duck and I mimicked her on the other and relatively quickly we’d plucked off enough feathers to enable us to skin and remove the breast meat (the majority of what’s edible) from the two ducks. They went into a coolwhip container in salt water and I carried them home. Now they’re in the crock pot with spuds and onion and garlic and a hot pepper and some sundried tomatoes. It’s a funny thing to see a place for ten minutes, hold it in memory for 8 months or so, and then drive up the driveway of an impulsive commitment held together by a fantasy of potential. The house is quite a bit larger than I’d remembered. The yard is smaller by half. There are more places through which I can see outside (that aren’t windows!) than I’d anticipated. Yesterday George and I wrestled the old Fridge outside and (after George picked up the dead rat with a pair of pliers and tossed it into the woods) I raked my kitchen floor! 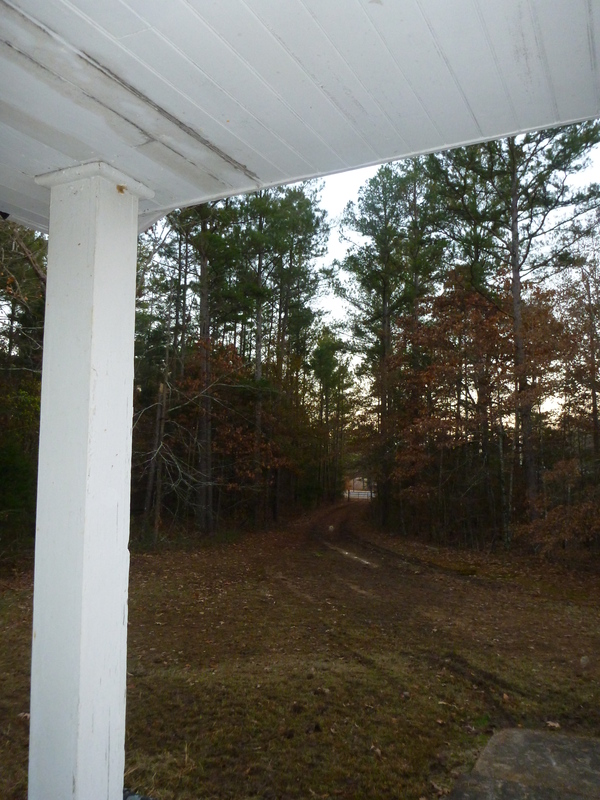 The mud daubers have done a magnificent job of colonizing the place (really glad it’s winter!) 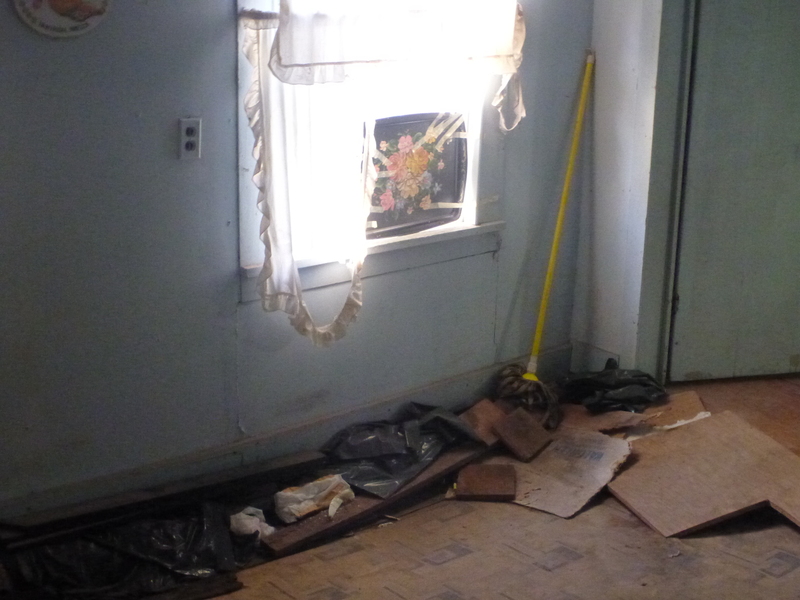 The previous owners left an array of treasures and trash behind. 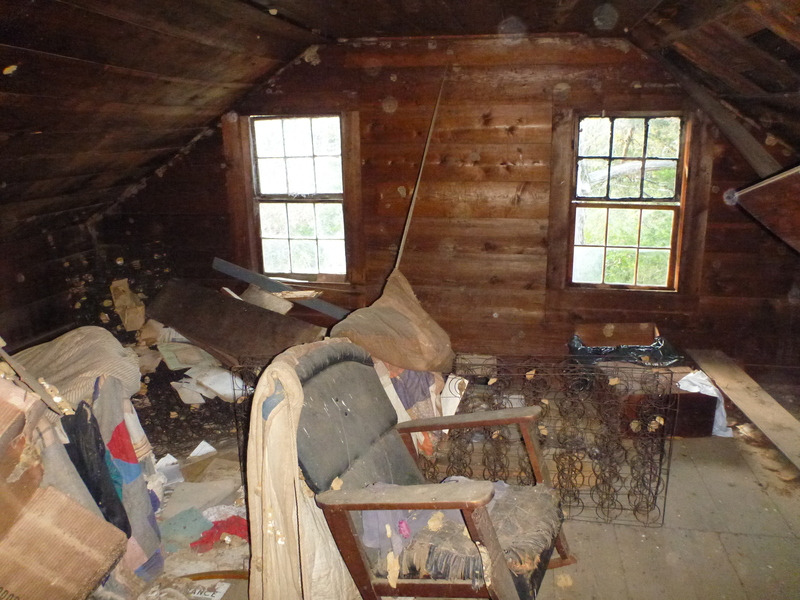 The amount of DIRT that accumulates over 40 years is beyond comprehension (or simple cleaning methods). The neighbors have been wonderful! Largely thanks to George and Jess I have a wood stove for heat, safe electricity in most of the house, hot and cold running water, a rudimentary kitchen and a working loo! 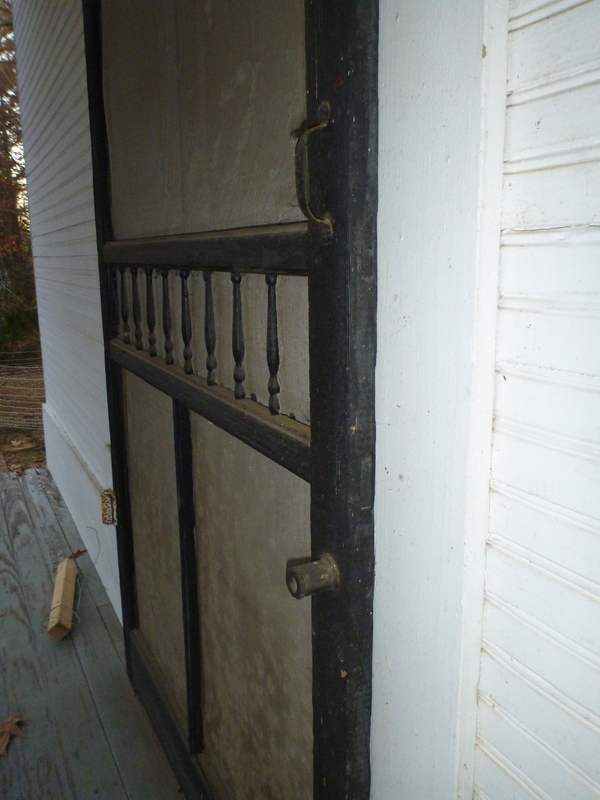 There’s wood on the front and back porches, hay for the horses and goats, and I’m not feeling entirely alone, daunted and terrified! 😉 Yesterday a woman drove up in a green golf cart with a bowl of fruit and crackers, introduced herself as Jo and welcomed me to Big Creek. She and her husband live on the other side of “my” woods – strange enough to own a house – incomprehensible to “own” a forest!? 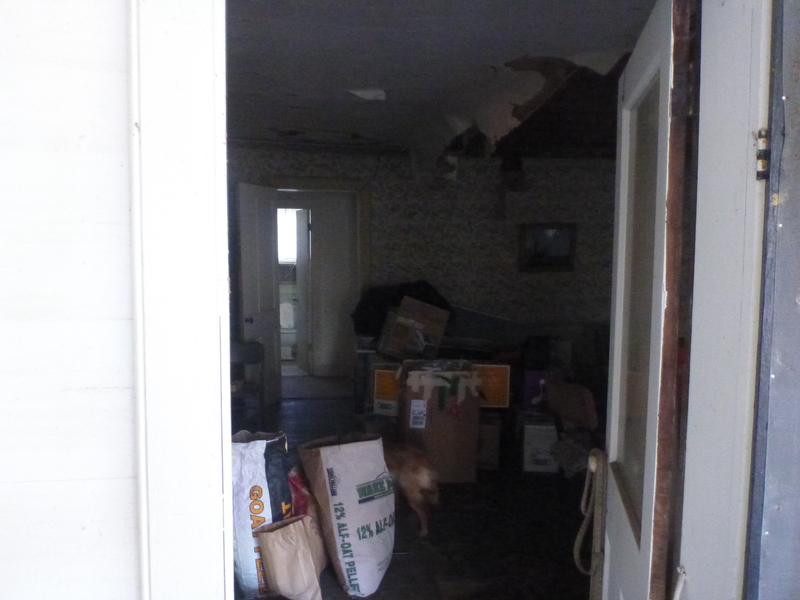 I have been given an old barn – it only needs to be disassembled, transported and built back up into a new barn. One of the farmers from this morning is the pastor of the Baptist Church across the street and he helped arrange pasture for the ponies as of today (only 1/4 mile from the house)! The other brought a 5 gallon bucket full of beautiful sweet potatoes – one of the major crops here. 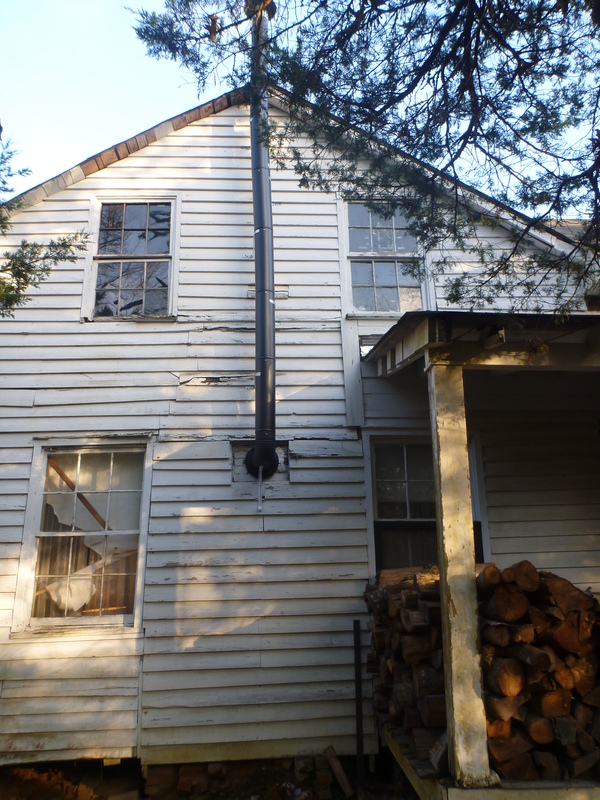 Later they showed up with a truck full of firewood and a crew to unload it and stack it on the porch! I’ve moved a Lot in my life and I’ve never felt so welcomed and taken in. I’m grateful beyond words – because without that care I’d be really freaking out about now! On a happy note, I picked up a young dog Thursday morning in Corinth on the way home. 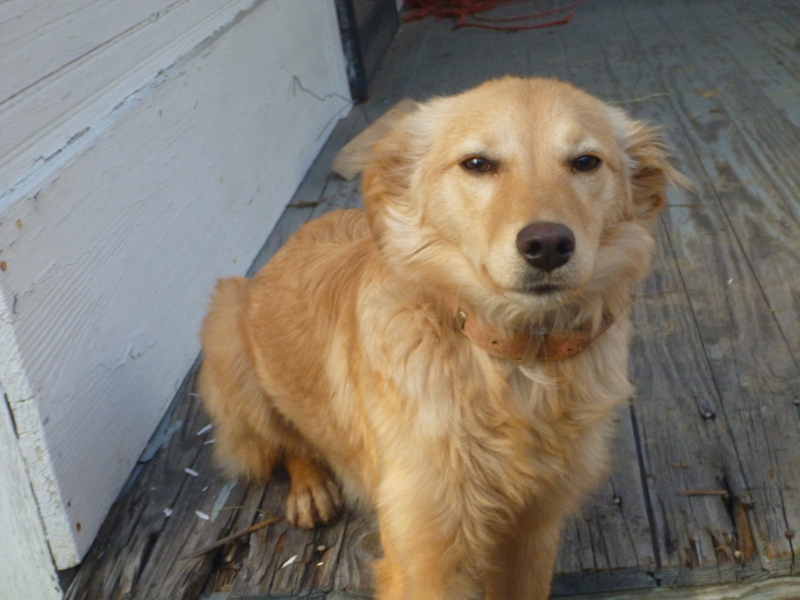 She’s a English Shepherd and spent the first 8 months of her life in a cage. She knows pretty much nothing – I literally had to teach her to go up and down stairs! She’s scared of almost everything and spends a lot of time hiding in small places. Yesterday afternoon she voluntarily joined me outside for the first time; usually it takes the security of a leash to move from a smaller space into a larger one. She’s incredibly smart and eager to learn. Already she’ll sit for the leash and has learned that she’s only allowed on the bed at night and to wait for an invitation. Even trembling with fear she’s never offered the least hint of aggression – gentle and sweet. She seems to have chosen the name Sheela, so that’s what I’m calling her. Then Sunday night after the Redneck Christmas parade (I had two of the three horses – the third one carried Mary and babydoll Jesus, led by Joseph – who was Mary’s grandmother. There were lots of revving trucks – one dragging duck decoys instead of tin cans – another with a lit-up seesaw on the hood pulling a float with somebody fishing on it – and ATVs and sirens and lights and unfortunately the camera battery was left home in the charger! The ponies did really well once we were actually moving down the road.) 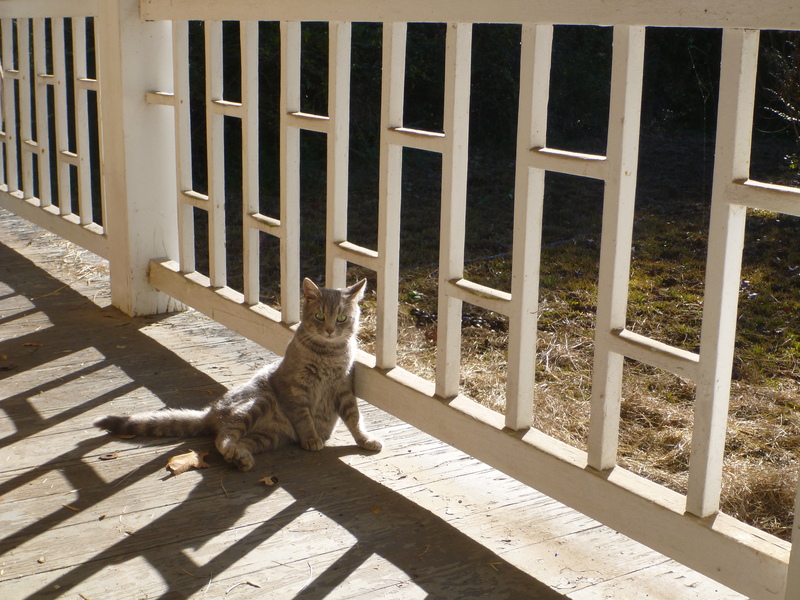 Anyhow – after the parade I was invited to the Steak House in town and when I emerged well fed and happy I encountered a beautiful young grey cat who said he was looking for a home. I told him he had to be sweet to the dog and hunt mice and rats. He looked up solemnly and gave a silent mew and he’s been absolutely true to his word. He walked into the house and Sheela ran and hid. While I was reassuring her he came up and rubbed himself all over her, purring! He’s absolutely the perfect cat, gently making friends with Sheela, hunting inside and out, nice to have around and he purrs when I pick him up to pet him. Lovely. 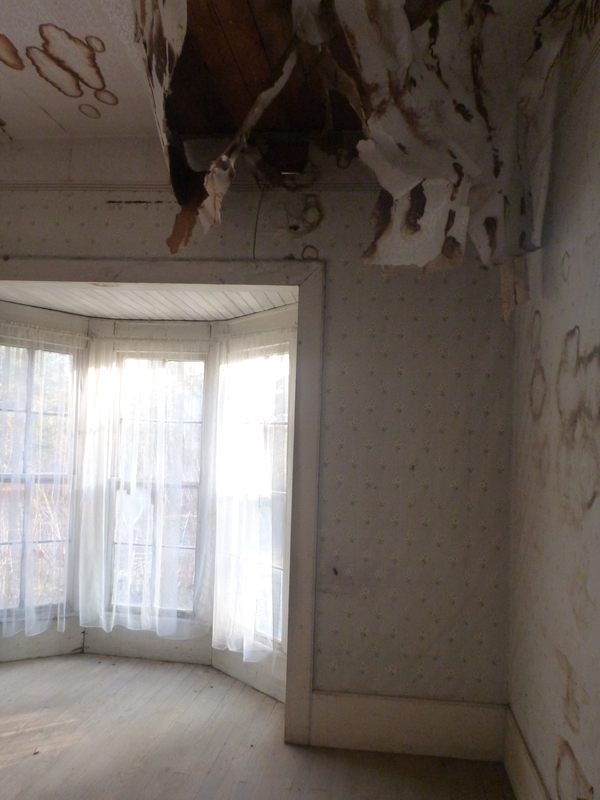 I’ve started to learn a few things about the house, which hasn’t been lived in in over 40 years. There used to be a weekly quilting bee in the front room with the bay window and there’s still a spool on the door half way between the handle and the ground so the little kids could let themselves in. 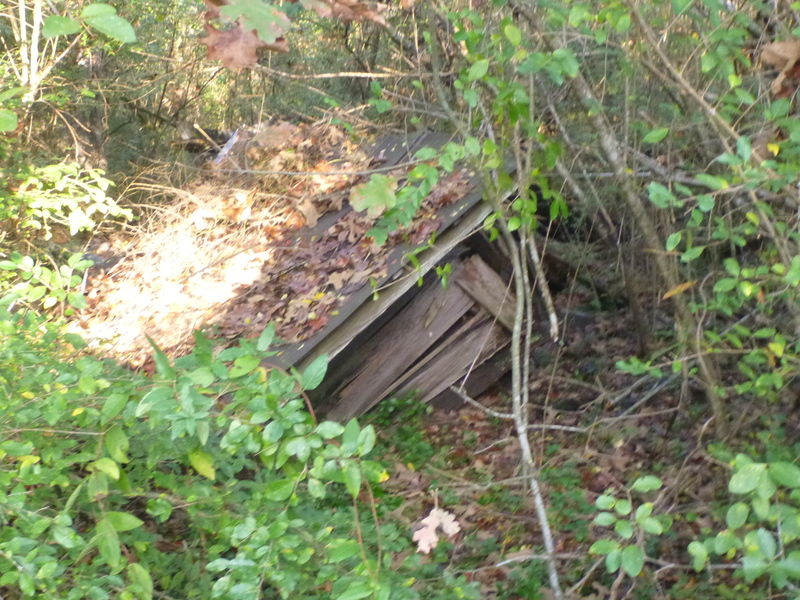 There’s a fallen down smoke house and an outhouse that a tree fell on out back. The forest is thick and brambly with vines and wee orange mushrooms growing out of pine cones. 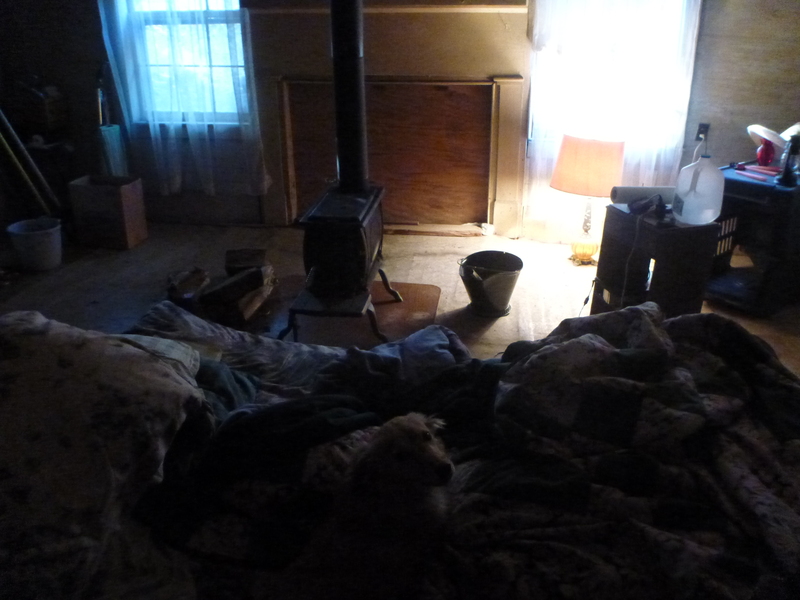 The room I’m sleeping/living in started out as the original log cabin and it’s absolutely silent – no old house creaking or groaning – it’s long time settled and solid. One night I didn’t even realize it was raining until i went out to the kitchen and only in the morning did I realize that it was so windy three doors blew open in the night. The wood stove keeps it cozy – a good winter room. This morning I decided to ignore all that there is to be done inside. 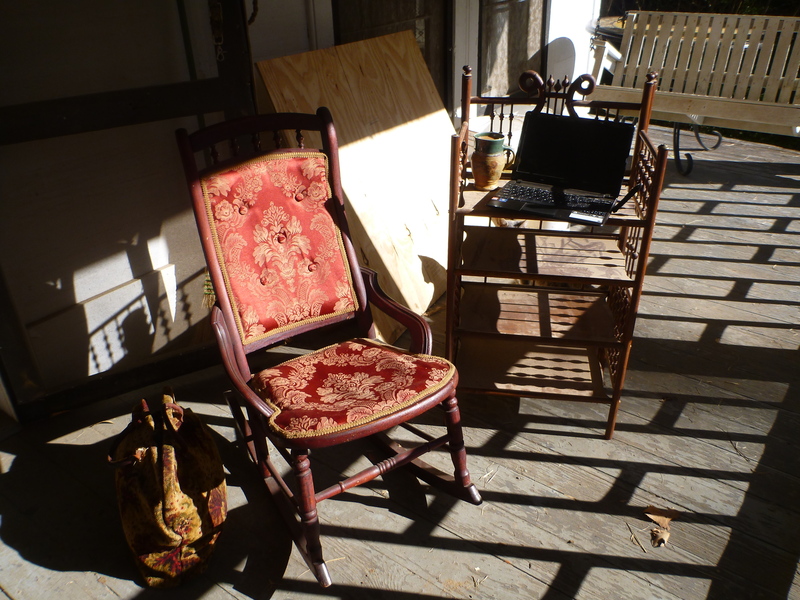 I’m sitting on my front porch in a rocking chair in the sunshine with Sheela the dog and the as-yet-unnamed cat. Gentle mr.James is keeping me company and occasionally begging treats; Saint Finehorn is guarding the driveway (on tether since she’s feeling prone to wandering). I’m drinking real coffee from my lovely new mug and remembering that even pioneers sometimes have to set a spell and catch people up on the happenings. More to come…. 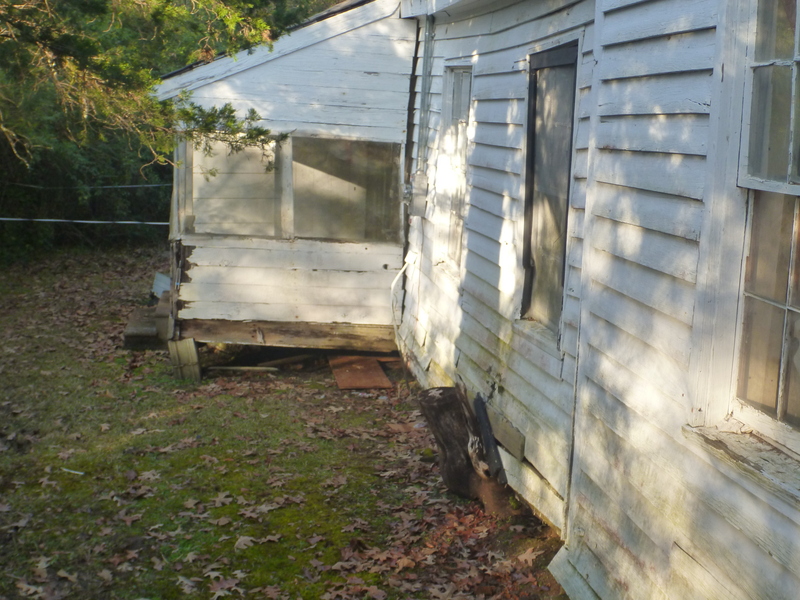 This entry was posted in Uncategorized and tagged Big Creek Store, good neighbors, moving in to an old house, perfect cat, Redneck Christmas parade, settling in, Sheela, steak house, wood and hay, wood ducks. Bookmark the permalink. I see that you made it home. Your house is beautiful. It is filled with so much charm and grace. The holes will get take care of in due time. I hope you had a great holiday. I had a lovely time with my three year old grandson even though I now need a nap. In fact, more than one nap would be nice. 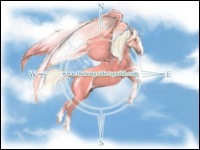 Your latest blog was interesting and with the weather we had here in Michigan you had to be in a better place. People absolutely panic if they lose their electric power and God forbid if they lose their tv cable or satellite dish. We are all getting too soft. You may be the only exception to that statement. How are you guys adapting to your new place, new members of the family and different routines? Have you found a good source for hay? Farrier? Vets? Hopefully you are finding life there still challenging as I think that if you don’t have a challenge, you might get bored. Listening to the nasty weather reports on the radio this evening, hopefully you’re all hunkered down and don’t blow away! Oh, and Welcome back to Mississippi! Still looking like we are heading out on our journey this spring!!! Santa told me tonight that I can seriously horse hunt now 🙂 Thinking abt “how” to even route plan our journey?? I have a least a 1,000 and 1 questions I’d love to ask ya. Merry Christmas to you and all your hoof and farm critters! Welcome to Calhoun County, Sea! My father’s family is from Pittsboro, and I have a number of relatives in the area. Even though I grew up in South Texas and still live in Texas (near Tyler), I’ve always loved “coming home” to Mississippi during my life. God bless you in your new home! hi Jerome – i spent 7 years of my growing up in Texas – dad was director of Sky Ranch, not too far from Tyler. Beautiful country out that way and a great place to grow up! So happy to read your latest blog and always look forward to the next. We crossed paths @ Rowe Camp in western Mass. You intrigued my wife Judi & I so, with your adventurous spirit. Some things were just meant to be. Sounds like all your neighbors are showing true southern hospitality at the highest level. You are one remarkable person, that has a goal and sticks with it. Like others we want to reserve a copy of your book too. Settle in or “get home” as we say here in NH. Congrats on all your latest home adventures. New old barns, those are the best like you & your home they have a great story to tell. Happy Holidays & Big ol’ Horse Hugs too! Enjoying your journaling. My name is Frank Hutchins and your horses are in my pasture. My wife Barbara and I live in San Antonio, TX., but we love to come back and visit Big Creek a couple of times a year. She has two sisters in Calhoun City and I am related to many of the people in Big Creek; the Warners, Hutchins, and others. 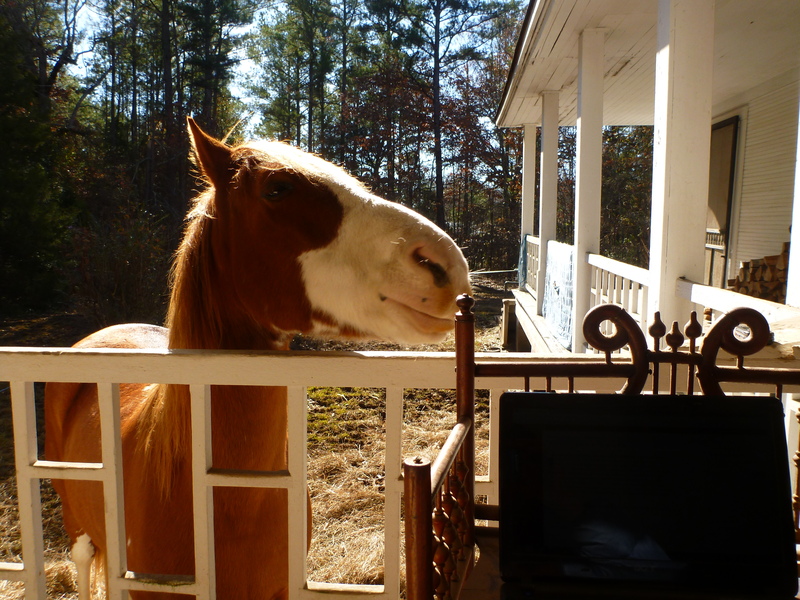 When we read the articles about your travels and you purchasing a home in Big Creek, I told Barbara that I wondered if you needed a place to keep your horses. Bro. Conley called me yesterday and got things worked out. It’s a win-win for both of us! A place for you to keep your horses and the horses will keep the pasture for growing out of control. Welcome to the Creek! Actually we live in the hill country, north of San Antonio. We’re 15 to 30 minutes from the nearest grocery store and shopping; have no neighbors and love it. We are also 30 minutes from our grandkids. Look forwarded to meeting you and your menagerie of animals. I just LOVE your stories. Your book is going to be awesome. I can’t wait to meet you in February. So happy you have gotten a warm welcome. Tell that herd of yours to stop trying to run away from you. HA! Can’t wait for the next pics of the herd and your new crew. House does not look bad considering how long it has been empty. Congrats on getting it. Would you believe me if I told you I was jealous? 🙂 Peoples’ kindness to you warms my heart and the additions to your clan make me smile. Bless you and thank you for sharing. Sea, if you dip the duck for just a couple of seconds in boiling water with Palmolive soap in it, it makes the plucking much easier. Yes, believe it or not, the girl who only wants room service knows how to pluck a duck. 🙂 Welcome to Mississippi. Oh! How wonderful your story of kindness, ‘welcome’ and hospatility is! I love that a dog and cat have joined the herd. I imagine they will be wonderful additions to your lovely ‘family’. With the story you tell, many of us might want to move to Big Creek! Thank you for sharing the celebrations and the challenges!